At Aqua-Tox we offer food intolerance testing with advice in relation to sensitivities and allergies to food. Developed by Cambridge Nutritional Sciences, we offer the foodprint service which utilises state of the art immunoassay microarray technology to detect food-specific IgG antibodies. The proceedure is painless and safe. The therapist will extract blood from a thumb/finger pin prick and send off the blood sample to the lab for testing. Food extracts are ‘printed’ onto nitrocellulose ‘pads’ on a glass microscope slide, together with calibration standards and controls. A blood sample provided by the patient is diluted and dispensed onto each printed microarray. Food IgG antibodies, if present, bind to the food extracts and the results are measured by a high-resolution scanner, before being calibrated against the standards using the FoodPrint reporting software to give quantitative results. This software then produces a tailor-made printout of the final food IgG antibody result for each food on the requested food panel and comes with a patient guidebook. Lab tests have options for testing 40 to over 200 foods and results are received within 10 working days. 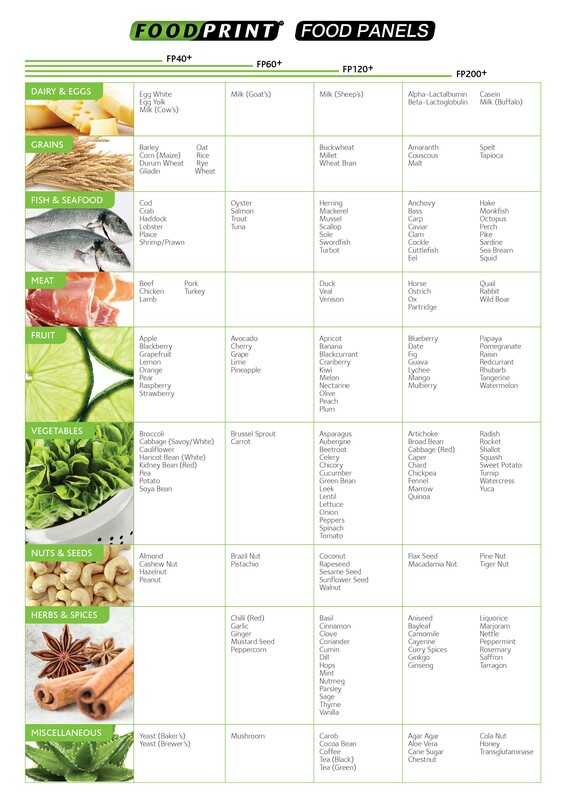 Click here for the FODMAP DIET SHEET to find out what foods are suitable for a low fodmap diet.